There were a lot of people (that I know) with birthdays this week. There were 5 within our medical school class! The older I grow, the more I understand that the passage of time isn't really dictated by the rate at which sand falls through an hour glass. It's really more about how many great / memorable events happen between t = 0 and t = x. Better yet, it seems to have a paradoxical effect: on the one hand, when a lot of events are happening (preferably good ones), time seems to speed ahead. Like the three parties I went to this weekend - I felt like they just started, and every time I looked at the clock, at least a half hour had inexplicably disappeared into the ether. On the other hand, I look back at all the crazy things that've happened in the past few months, all the new friends I've made, all the new experiences I've... experienced (hey I never said I was a wordsmith) and it's a bit shocking to realize it's been just that - a few months. I guess I'm not used to having so many events occur so quickly: I feel like a year has passed - but nope; less than 6 months have passed. I'm not sure I like either effect events have on the passage of time. But then again, it's not like I can argue with time (I've tried, time is very stubborn). And I definitely don't have anything to complain about. So I'll just sit back and watch the grains of sand fall. On a side note (you didn't think I'd end without one of these did you?) - thinking about events that've passed made me reminisce about my undergrad institution. Mainly, I just think back to the 2 am Mario Kart sessions. My next thought? Well, an xkcd cartoon best explains it. To anyone out there who knows about / plays Mario Kart... you'll definitely understand this one. 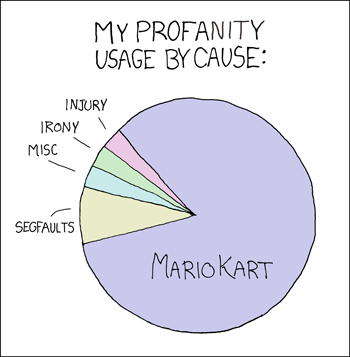 For those that don't - drop what you are doing and go play Mario Kart. Words of wisdom from a friend of mine:"Karma is when you drop a banana peel [in Mario Kart] and slip on it yourself"